For many of us, the New Year is a time to start fresh. It’s the time when we set personal goals and make resolutions, but don’t forget about our companion animals. Have you ever considered making a New Year’s Resolution for them? There are many ways that you and your pet can help each other make 2013 one of the best years yet. Here are some suggestions for your pet’s New Year’s Resolutions. 1. Exercising regularly is good for our physical and mental health. These benefits extend to your pet(s) as well. If you normally walk your dog a few minutes a day try to increase that by 5 minutes weekly until you are walking at least 30-45 minutes a day, unless you have an older dog like my Charley Girl, who has joint issues. For older pets, take them on more frequent shorter walks. For Charley, she gets 2-3 shorter 10 minute walks during the day. The important thing is to get them out to enjoy the outdoors – even if it is for a good sniff! A dog that gets appropriate exercise has fewer behavioural issues and will “act out” less. Many cats enjoy strolls outside on special cat harnesses and leashes. Spend time playing with your cat – they love the attention and can benefit from the exercise as well. Remember our pets count on us to provide them with exercise and enrichment. 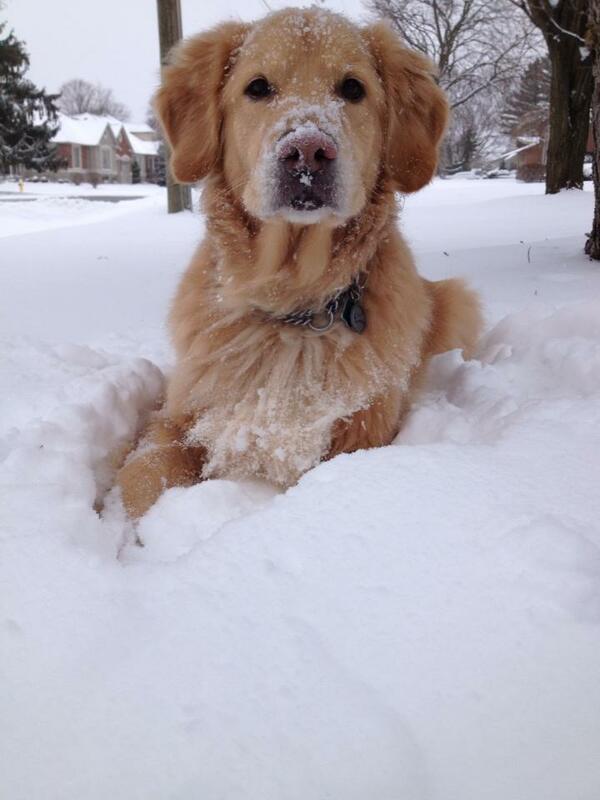 Wynne's (our Client Care Rep) dog Sam playing in the snow. 2. Eating smart is good for us and also for our pets. Invest in the best food you can for your pet. Whether you are feeding a store- bought brand or home-made, pet food options have increased in recent years. Foods can be tailored towards dietary needs, activity level and your pet’s age. Talk with your veterinarian or veterinary staff member about your concerns. Good food can help your pet with weight loss as well as improve his or her health. I’ll only give my dogs healthy pet treats and definitely avoid the following list of “bad foods”: chocolate and cocoa, sugarless gum and candy containing xylitol, leftover fatty meat scraps, yeast bread dough and fruit cake. Particularly dangerous, fruit cake often contains raisins and currants, which can result in kidney failure if ingested by a dog. Some fruitcakes are also soaked in rum, resulting in alcohol poisoning; when ingested by a dog or cat, it can cause a dangerous drop in blood sugar, blood pressure and body temperature, potentially leading to seizures and respiratory failure. As I have said before, thank goodness I am not a dog – and I still have 9lbs of chocolate to eat. Any volunteers? 3. Take your pet to your veterinarian at least once yearly or for those pets over the age of 7, at least twice yearly. Pets may not require vaccinations every year but they do require at least yearly examinations. “Raindrops on roses and whiskers on kittens. Crisp apple strudels and schnitzel with noodles” – these may be a few of my favourite things BUT heartworm, intestinal parasites, fleas and ticks – these are a few of Yukon and Charley’s least favourite things. I resolve to ensure that they get their preventive medication on time every month!! Dr. Fulop at home with Amber. 4. We all know that life gets busy, and the New Year is a time to reflect on what is truly important in our lives and how we choose to use our time – like spending more time with loved ones. Getting home from work sooner allows us to spend more time with our pets and this has been shown to lower stress and increase overall happiness. I resolve to spend more time with family and friends – including my pets, so that I can treasure special moments and memories. I love my pets so much that I want them around as long as possible. If you are like me, then we all need to start 2013 with firm resolutions to provide the best pet care we can, because your pet deserves nothing less.